Customers across Johnston, Wayne, Wilson, Harnett, Sampson, and Duplin counties trust Ormond Energy to provide premium fuel service at the best possible price in the region. Our team has over 60 years of experience providing North Carolina homeowners, business owners, and farmers with reliable fuel delivery, professional equipment maintenance, autogas service, and more. However you power your home or fuel your company, Ormond Energy is your local go-to energy expert. 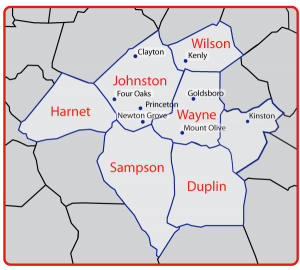 We are proud to serve the following North Carolina towns. If your home or business is located within our service area, contact us to schedule your next fuel delivery or become a customer!